Peter Thomas Roth Irish Moor Mud Mask- I crown this mask the messiest one I own, but the mess is worth the results Peter yields. Every time I use this mask, my skin feels extra clean and calm. The mud itself doesn’t get dry or hard, so, in theory, you could leave it on for hours. Why not? Wash it off to reveal pampered skin. Aztec Secret Indian Healing Clay- Now, this mask is not for sensitive skin!! If my skin feels really oily and dirty, even a little bumpy, I reach for this product. It gets verydry and could irritate those who aren't used to intense products. However, this mask is the ultimate blemish fighter/reducer/killer/eliminator. Give it a go. 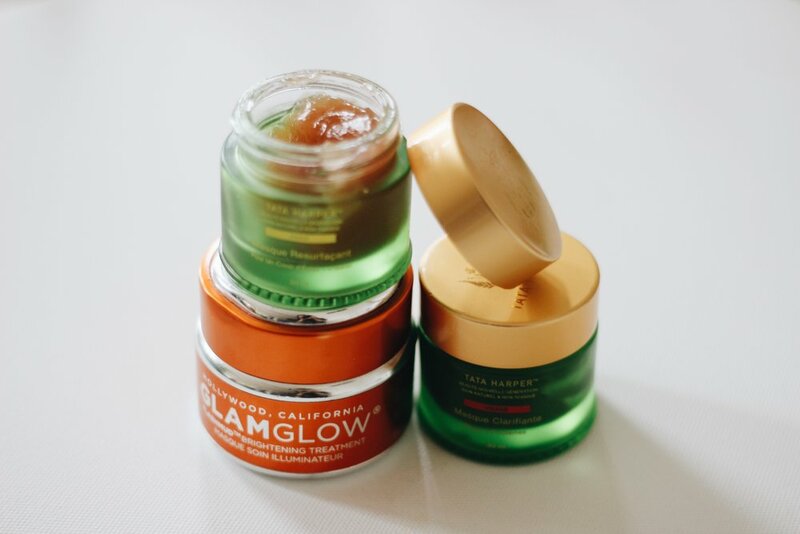 Glamglow Flashmud Brightening Treatment- This mask is the mightiest of all the brightening masks I’ve ever tried – ever. This is a two-in-one, double-threat machine: the mud has small beads in it that become an exfoliating face wash when you rinse it off. It’s basically a spa visit neatly packed in a little orange jar.